Sometimes even committed Democrats need to get away from politics for a little while. It can let other things into our lives, and July/August seems like a natural time to do so. We’re enjoying a break from a long year of protest marches, Congress is in recess, the president is on vacation from everything except compulsive tweeting, and even Rachel Maddow took a week off. Accordingly, I spent about 10 days recently in red-state America indulging my passion for playing acoustic guitar at a weeklong “camp” in Memphis with the masterful Tommy Emmanuel, and then driving on for brief stays in Nashville, Knoxville and Asheville, NC–that corridor of iconic musical influences along an otherwise tedious interstate highway. Political issues never came up, either over meals or on stage, among about 120 folks from all over the country and around the world who were engrossed in sharing and improving their musical skills. In fact, the prevailing ethos of a musical jam is to listen to others and enhance the whole with one’s talents, not bludgeon others into submission. Still, the political lens is unavoidable even if the focus is on other matters. This part of the country is still in the midst of primary election battles, so billboards and cable news shows are rife with candidate ads. At least among those running for governor of Tennessee, Democrats seek votes by supporting medical marijuana, and Republicans mainly want to convince people they will be super tough on immigrants of any sort. For Californians, so used to cultural diversity, it was nonetheless striking how well the South has at least publically come to terms with its racially problematic history. Certainly the scars of that long process are still present, but I found far fewer monuments to Civil War “heroes” than plaques recognizing the notable contributions of black luminaries. Along Beale St. in Memphis, for instance, I read about the work of Ida B. Wells (1862­-1931), a co-founder of the NAACP, who began her activism teaching school and publishing a truth-telling newspaper in that city. And touring Jack Daniel’s distillery in Lynchburg, TN, I heard frequent homage paid to Nathan “Nearest” Green, the onetime slave who taught Jack Daniel the art of making fine Tennessee sippin’ whiskey. Not surprisingly, the music of that region–blues, jazz, ragtime, and early rock ‘n’ roll–joyfully belies the prejudices and constrictions of the society that produced it. Sun Records may have focused on white artists–Carl Perkins, Jerry Lee Lewis, Johnny Cash, and, of course, Elvis Presley–but the music itself was clearly the bi-racial stepchild of what had previously been pigeonholed as “race music.” And Stax Records, renowned for its prodigious output of blues, gospel, funk, and the emergence of “Southern Soul,” built itself from the start as a conscious model for a racially integrated recording business. In travelling southeast, though, it was admittedly difficult to decompress from the typical Left Coast atmosphere of constant political outrage. The president or his disgusting tribe of enablers in Congress must be doing their worst while I looked away at things more pleasant. Surely there were new indictments, accusations, or secret recordings to know about. At home, among like-minded friends, how often we could joke about moving to another country–separating ourselves from the collection of states that seems so disunited. But it did not take long before the music we immersed ourselves in and the brilliant artists we learned from and socialized with daily took control and set a very different mood. It was partially the grandeur of the humble art form, the charisma of great artists, and perhaps also the benefit of simply getting away. I was most moved, I believe, at the final day’s farewell session after breakfast when rather than speaking about music, the 63-year-old Australian-bred, globetrotting Tommy Emmanuel explained why he is at this moment applying to be an American citizen. As a much younger musician, he recalled, he would habitually learn and earn what he could in Australia, only to spend it all on a plane ticket to Los Angeles so he could join in the music scene there for a few days until his money ran out. What he knew was that everything he considered “the best” was American–the music and musicians, the cars, the guitars, the clothes…everything! And the overwhelming negativity of this political moment is not going to ruin what he knows to be true and worthy of admiration. Something for the jaded among us to think about while away on vacation. The startling national news of the weekend was that Dianne Feinstein was denied the party’s endorsement for a fifth term in the Senate. Not just denied, but humiliated. She not only failed to reach the 60% approval threshold, but landed well behind her far lesser known challenger, Kevin de León. I had a curious experience at my front door a couple weeks ago with a Santa Barbara city council candidate out walking my neighborhood canvassing for votes. She told me she was a Democrat, so I imagined for the sake of efficiency she was working from a list of Democratic households–no doubt augmented with folks from that other party machine, the Decline to States. I tried to explain the futility of like-minded voters splitting up rather than unifying. I said the party’s governing body, the DCC, had interviewed candidates after they’d filled out a lengthy questionnaire. I sit on that body and I heard several aspiring candidates present their qualifications, answer pointed questions both in writing and in person. Each candidate got 15 minutes or more of our undivided attention, and the discussion preceding our vote was unlimited. I wondered how this Democrat, who had not even asked for the party’s endorsement and had kicked off her campaign after Labor Day, could be so sure she was the superior choice for people who hold Democratic values, when she hadn’t gone through any vetting process–neither from the DCC nor the other politically focused endorsing groups in town such as Dem Women or the Women’s Political Committee. I have to admit I didn’t inquire further about this candidate’s personal background or stated positions on important city issues, such as affordable housing, water conservation, or the Measure C sales tax proposal. I argued instead, that splitting the vote among numerous Democratic candidates was an effective way to get someone who does NOT share our political values elected to office. It’s simple mathematics, and considering our local election history over the years, it’s a concept that South Coast Dems seem to struggle with. We are so convinced that we are invincibly blue, that we never consider the benefits to be achieved by all of us working together, pulling the same cart. And we quickly forget the past losses when we split up and follow our separate desires. We also like to ignore the fact that in some elections and in some parts of the county, Republicans outnumber Democrats–especially when you factor in propensity to vote. So even city races are not always a shoo-in for our side. Congressional races even less so. The very earnest, probably quite liberal candidate at my door offered one more piece of persuasion–that she was being endorsed personally by an impressive list of local Democratic office holders present and past. The half-dozen names she provided are all of respected, progressive political figures. Perhaps not incidentally, they are all female. Most notably, though, they are all people who in the past have earned and enjoyed the endorsement of the Democratic party when they ran for office. They assuredly know the benefits of that endorsement. My reply on the door step was simple: “They should know better.” To use the party’s endorsement and promote oneself as if it should matter to voters when one runs for office, but discard that loyalty when it suits some other purpose is unworthy of these fine public servants. I was asked recently by one of our most active club members for a frank appraisal of how much sway the party endorsement has with voters. There is a long answer that describes the substantial power of unified grassroots action, political solidarity, and access to funding and know-how. But in sum, it is what we make of it. If we are trusted by voters and can offer effective strategies and a dedicated volunteer base, we become the endorsement most desired by the best candidates. And the question answers itself. If we treat party endorsements like loose change in the sofa cushions–why not pick it up if it’s there?–well, that’s what it becomes. After months of agonizing consumption of news and commentary, I’ve come to the conclusion that we Americans get the kind of elected officials we deserve. After patting ourselves on the back for our carefully conceived and hard-won democratic institutions–the very point of the Fourth of July holiday–we can’t just turn around and blame our mistakes on the Russians or Fox News. Whatever you think about the Trump presidency or the current Congress, it didn’t happen by accident or deception. Everything politicians do or say on the campaign trail or while in office is reported in detail and widely proliferated by a free press and hyperactive social media. And despite silly claims to the contrary, our votes are cast and counted scrupulously. We can’t honestly escape the conclusion that our elected leaders represent us–in all senses of the word. If that’s the case, we should put our energies into improving ourselves, not whining about hackers. That story will be told, but it doesn’t change the fact that we are a divided and dysfunctional nation. We cannot seem to find a voting majority for wise, compassionate policies, yet ignorance and greed still manage to win elections. In such a state, the preoccupation with impeachment, resignation, or early removal from office is actually dangerous. These shortcuts not only ignore an administration full of venal incompetents and enemies of progress who would be left in place, but they promote an equally horrendous replacement, who will nonetheless be welcomed to the captain’s bridge with a great national sigh of relief. Those of us old enough to remember the early 70s know that Mike Pence is not a Gerald Ford figure, yet the palpable goodwill for the poor guy who has to step in and govern under such volatile circumstances would be assured. We would be far wiser, starting right now, to devote ourselves to a healthy turnaround–district by district, Senate seat by Senate seat–in 2018. The Republican majority has done plenty this year to alienate voters on so many fronts, but particularly health care. They are vulnerable in 2018, but not if the nation believes it has turned the corner with an impeachment trial. Locally, our own district, CA-24, is home to several thousand more Republicans than Democrats who are likely to vote. Moreover, we have been officially targeted for unlimited GOP financial investment next year, and it’s a certainty that our newly elected congressman, Rep. Salud Carbajal, will be outspent by whoever becomes his opponent next year. We have our work cut out in keeping that seat blue–registering voters, communicating with them throughout this year and next, and finally motivating them to show up on election day. We really haven’t got time to waste on the opioid of impeachment speculation. Unless Congress changes colors, changes in the White House are pointless. The belief that we learn primarily through suffering–attributed to the ancient Greeks while they worked out this thing called “democracy”–is pertinent. The late syndicated columnist Molly Ivins used to invoke a Texas parable of The Chicken Killing Dog. In rural lore, it seems, the cure for an undisciplined dog that kills chickens on the ranch is to wire a dead chicken around the dog’s neck, right under its nose, and let the dog enjoy the ever-present fruit of its bad habits for weeks (or even months) while the chicken carcass rots. It was a sure thing, Ivins said, that dog will learn its lesson. Let’s be frank, after a hundred days of utter insanity our capacity for shock and outrage has been almost used up. The unacceptable is thrust at us daily, and the unthinkable has become routine. Yet we have to hold back on alarm because we know worse is on its way. 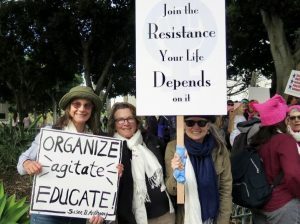 Opportunities to protest and resist are abundant–especially here in Santa Barbara, the shiny buckle on the Blue belt–but a sense of despair creeps in nonetheless as the affronts to our values, needs, and safeguards multiply faster than they can be beaten back. In this frame of mind the other evening I viewed Michael Moore’s most recent documentary, Where To Invade Next. Filmed and released well over a year before our presidential election, Moore’s premise was to visit and film–“invade,” as his conceit goes–various nations around the world where progressive political and social policies are succeeding in enlightened societies. Though the concepts in many cases originated in the U.S., these other societies have taken our ideals and unfulfilled hopes and put them into practice. Tongue-in-cheek, a chubby, shuffling but ever-earnest Michael The Conqueror strives to claim and take home the riches found on foreign soil. Italy treats workers better than we do. France feeds its school children more wholesomely. Finland achieves the highest of educational results by encouraging students to enjoy their childhood without standardized tests and nightly homework. Slovenia provides its youth (and some of ours as well) with debt-free higher education; Portugal demonstrates the benefits of decriminalizing drugs; and Norway takes an incredibly daring approach to prison reform. Even Tunisia is far ahead of us in looking after women’s reproductive health. Iceland gave the world its first democratically elected female president 37 years ago, and though one of the hardest hit nations in the recent worldwide financial meltdown, it also has gone the furthest in prosecuting and punishing the bankers who caused it. Perhaps most instructive for us could be Germany, a comparable economic powerhouse that has done so much better at balancing work and leisure for its citizens and has also modeled acknowledgement and contrition for its historic national sins. If we were to deal with our own foundation in racism and genocide as deeply as Germany has taken account of its Nazi past, we would probably not today be trying to figure out a demagogue presidency. One wonders, will we ever catch up? Especially as we charge headlong in the wrong direction on every single issue. Of course, one obvious answer is that some of us already live in an enlightened, progressive nation–California! We are not without serious problems–nor are the societies listed above–but we are governed by a supermajority of forward thinking leaders in our legislature and statewide offices. Our economy is the sixth largest in the world and growing. We attract capital and innovation yet pay workers a living wage and make legal commitments to equality, diversity, and protection of the most vulnerable among us. California is influential, inclusive and fully aware of what makes it a leader in the world and what it has to lose under clown-tyrant rule. What California lacks is national sovereignty. Perhaps that will one day change, and Michael Moore can invade us, too. I know, it’s been quite a while since the last full-strength DSC Newsletter–to be precise, since a few days before the Tuesday in November that lives in infamy. We all grieve a sudden loss in different ways, but typically it is a process of shock, adjustment, reflection, and then determination to proceed with the support of family and friends. And in this case, equally shocked fellow Americans. Undeniably, we’ve lost something we love–at the very least a sense of national identity we were proud of. We’ve been brought face-to-face with some grim possibilities–for instance, America as an unpredictable, disruptive geopolitical force in the world–that we never seriously contemplated before. But that’s where things stand, and it’s time to carry on. Many of us already are doing so quite remarkably. Well ahead of the actual transfer of power, many worried Santa Barbarans came together to form the Santa Barbara Progressive Coalition, which now holds bi-monthly meetings and organizes a broad-based resistance effort. And when the time came, our activist community turned out impressively for local demonstrations on both the Friday and Saturday of Inauguration weekend. Pulling together our community’s contribution to the historic women’s march in Los Angeles was the extraordinary work of the SB Women’s Political Committee, but the participants came generally from a city determined to stand up for its values. A new factor in that devotion is a group calling itself Indivisible Santa Barbara, part of a nationwide Indivisible network that makes engagement with issues and our lawmakers into a daily exercise. The Democratic Service Club has generally focused on serving candidates and issues endorsed in an orderly process by our county and state Democratic Party. Our contributions are vital, but mass mailing, voter reg. tabling, and phone banking are by nature sedentary. Even precinct walks are typically solitary. Now we must embrace the need to force change through monumental communal pressure. The streets and town centers are really the only avenues for this, and we’d be remiss to wait for the next election cycle. Two months of unrelenting chaos forces us to contemplate what two years of the same could look like. The success of public protest is always uncertain, and beyond the California border perhaps hopeless these days, but that’s where the action is right now and may be so for some time to come. It’s Not Over Yet, But We Wish It Were! our country–finds it a close call. To be further cheered, check below for a brief history of what the DSC has been doing lately and find out what is being asked of us in these final days. The thought of the Obama administration coming to a close is an almost embarrassing reminder of how little I knew about political activism eight years ago. Sure I followed politics in the media, but before that landmark election, I’d never really participated beyond casting my own ballot. I barely knew a phone bank from a piggy bank and had only the vaguest notion of what the deceptively cute term “grassroots” entailed. And I’d certainly never given money to a politician. I suspect my story is not unique. This whole process of political immersion has taught me some valuable lessons–too many to recite here–but one of the most important is the need to think and act beyond the narrow scope of one’s self-interest. Good government does not always operate the same as a market economy under Adam Smith’s proverbial “invisible hand,” where widespread benefits result from private individuals looking out for themselves alone. Democrats think, almost instinctively it seems, in terms of connections, communities and shared progress. Right now, for instance, many of us who have finished a career and left the work force have gotten seriously concerned about college tuition. Why? And we’ve figured out that health care reform in this country demands people buy insurance while they are still healthy rather than wait until they are sick. In a similar vein, most of us reading this reside in Santa Barbara County, but far fewer live in the 3rd District. For the sake of the county at-large, though, we need to support energetically, our spectacular Democratic endorsed candidate, Joan Hartmann, who hopes to represent that portion of our sprawling county. We who aren’t voting in any supervisor’s race this time can’t afford to leave that crucial seat–one of five on a perpetually split board–to chance. If you don’t live in I.V., though, why should you care? Well, first of all we just have to respect and support the difficult journey that community has made over the past half-century and the recent process of local engagement that has gone into getting this concept on the ballot. Significantly, the E and F campaign is planning to register 13,000 voters in Isla Vista, most of whom change address every year. That army of voters will probably favor the IVCSD, but should also be crucial to keeping a progressive majority on the Board of Supervisors as well as carrying so many other good candidates–Salud Carbajal and Monique Limón, to name just two–to victory. It’s all connected, and there’s nothing invisible about it. If I had a dime for every column inch of newspaper, magazine, and internet commentary this year that has attempted to explain the rise of Donald Trump into serious contention for the presidency, I’d be a billionaire able to fund my own super-PAC. Truly, I’ve tried to avoid adding to that excess of verbiage, both in writing and conversation with fellow Dems, but as we get closer to the national party conventions this month, when the spigot of political clap-trap is opened widest, the temptation gets irresistible. My first belief, though, is that talking about a mean-spirited, abrasive braggart, hawking senseless, inconsistent political vitriol is less important than figuring out why such a figure is persuasive, or at least attractive, to about forty percent, perhaps more, of our country’s voters. The oft-heard phrase “We’re better than that” is not re-assuring. Apparently we’re not. If we were governed under a parliamentary system, it would be expected that fringe parties and loony candidates will pull in a certain fraction of the electorate. But our country has traditionally done politics with a binary access to power–two major parties pitch broad agendas and internalize their coalitions long before heading into an election. If one of those parties has gravitated toward a certifiable nut-job and found peace with demagoguery, then something very tragic is going on. The individual spokesman for this corrosive outlook on national affairs is actually unimportant. These Trump voters have been with us all along, and if denied their first choice, would have found someone else to back this year–just not someone so perfectly attuned to their tastes. And I don’t think it’s globalization, economic distress, or even just a sullen mood and passing fit that has brings us here. To a surprising and uncomfortable extent, we are a bitter nation. It’s a character trait that begs some serious introspection, and the answers we get from out hearts and our history will be no more cheerful than they are surprising. So much discussion this year–indeed this past fortnight!–has circled around the existence of racism in our ever more diverse society. A very touchy subject, but not inappropriate. We are, after all, a nation founded on genocide and sustained for over two centuries through slavery. Early on our forebears decided that dark skin was inferior and economic exploitation and racial conquest justified. These are not attitudes that disappear from a culture in a few decades. Is it any wonder we are just now engaged in a national discussion over whether black lives matter? At this point there seem to be both pro and con sides in that debate. The ingrained distrust of unfamiliar cultures and religions, the high regard for winner-take-all entrepreneurship, the frontiersman’s need for simple solutions to complex problems, and, of course, our national fetish for firearms are all bedrock American traits quite evident throughout our history as a nation. It’s no surprise to see these attitudes in resurgence. What is a bit perplexing, perhaps, is a candidate for President of the United States promising his followers that with his leadership they can “take back ” their country. If anyone has a claim to such a restoration, it would certainly be our Native American population. But no, it’s the longing of the great heartland–white, aging, and without any particular job skills–who fear their long era of unmerited ascendancy drawing to a close. Trump Nation is a troubling voting bloc for an America anxious to progress and overcome, but we should not think of it as marginal or likely to flag. Even California is not immune–1.6 million of us voted for him last month–but we are definitely a bright spot in the Union with a thriving economy and diverse, forward-thinking political leaders in both houses of the legislature and every single statewide elective office. For various reasons I’m confident that in November the nation as a whole will take after California more than Indiana, Texas, Georgia, or Missouri. Nothing to be smug about, just electoral odds-making. The substance of national character, though, is something we still need to work on. The race for the congressional seat currently held by Rep. Lois Capps has been going on for over a year, and we’ve just now reached the Primary. We’re all aware that more than one Democrat would like to succeed to that position, and that each of those candidates has dedicated supporters within our normally unified partisan community. Considering the possibilities for hard feelings and nastiness that can spring from such divided loyalties, I’d say we all–candidates and supporters–have done an admirable job of keeping things civil and respectful. Still, I have fielded a certain disappointment from some club members that the DSC has focused its communications and volunteer efforts solely on behalf of one candidate rather than helping Democrats in general. That charge is certainly true; we have put our energies behind a single candidate in this race, but that’s not something to be rectified. It is simply the way to keep the 24th District where it has been for the past 18 years–in the capable hands of a progressive Democrat allied with a national platform of broad-based prosperity, inclusiveness, environmental stewardship, and a thoughtful approach to world affairs. If more than one local candidate shares those values, then we’re most lucky, certainly compared to other states and communities. But in a top-two primary system like California’s, there is no assurance that even one of those candidates will be around to run in the General. Despite a Democratic advantage in registered voters in the district (which, by the way, extends to the Monterey County line), the reality is there are about 10,000 more Republicans than Democrats likely to vote in this Primary. Yes, we know who they are, because voting records show our electoral habits. And in that case, we have to give serious attention to discerning which candidate has the breadth and depth of support to carry those values forward. There is a real risk involved in being cheerfully even-handed or devoted to parochial interests. It would be naïve to ignore the fact the California Democratic Party gave its most active, grassroots members a chance to express a preference earlier this year, and they chose to endorse Salud Carbajal by an overwhelming majority. Supervisor Carbajal has also received the endorsements of the House minority leadership and of the chair of the House Democratic Caucus, not to mention Lois Capps herself. And like it or not, fund-raising capacity will be key to a successful run for office. Good policy proposals and political virtues need to be broadcast widely, and the various media of communication–traditional or New-Age–cost money. The Carbajal advantage in this realm is undisputed. Not insignificantly, the Democratic Congressional Campaign Committee has made our district its number one targeted race nationally, which means the Carbajal HQ is teaming with DCCC staffers from all over the country, directing unprecedented resources here. This does not reflect special interests who have exacted questionable promises from a candidate, but rather elected Democrats who see the national stage and know what it takes to keep this seat blue. The Democratic Service Club stayed assiduously neutral for months while candidates introduced themselves to voters. That was an important phase, but the campaign has moved on, and to remain neutral now isn’t a way to “help all Democrats”–it’s the way to help Republicans have the November ballot to themselves. Are you tired of watching other people vote? Or hearing about what voters in other states have done? In presidential politics Californians are expected to be the adults at the table–to wait until the children have had their fill and then make intelligent conversation over what’s left. Fortunately, further down the menu the choices are often locally grown and more to our taste. But either way, it’s now time to choose. Voting in this year’s election begins for us in less than a month, when Vote-By-Mail ballots go out on May 9, and things wrap up at the polls on Election Day,June 7. Whenever or wherever we mark our ballots, we are taking part in the grand enterprise of self-government. This year, however, that seems like something less than noble, even unworthy of a great world power. It’s an effect that has many causes and has been a generation or more in the making, but the result is that a vast portion of the citizenry wishes to distance itself from politics and declines to take part in any meaningful way. I can empathize, but honestly have a hard time agreeing with much of that sentiment. Voting–wherever in the world it’s done–involves an amazing form of alchemy: we manage to increase wisdom by multiplying ignorance. And there’s certainly no shortage of ignorance in our country this time ’round. The point is we are all limited in our political insights and our knowledge of people and the world. But if a great many of us make the effort to participate, we arrive at a place far superior to where we’d be if we left the choices to some anointed elite, no matter how brilliant they may be. Amazingly, ignorance is rendered into wisdom–or at least something close to it. It’s not just wishful thinking. The more of us who vote, the better our governance will be. Certainly it helps to have educated voters–something that wise voting choices can directly promote if not ensure–but at least, in the long run, we get what we deserve in the way of leaders. Naturally, we can’t let this process be bought and paid for by special interests. Money must be used sparingly if this elemental exchange is to work. When we make phone calls, walk precincts, or register voters, when we table at public gatherings or generate mass mailings, we are taking part in this alchemy. There’s no wizardry involved, just honest conversations with our neighbors and a focused effort to keep voters on the rolls and to start newcomers on the right path. Our steady volunteers, and even occasional ones, must have an intuitive sense of the magic they are performing, because we do it over and over. And it should be applauded. The local coordinated Democratic campaign, working to elect Salud Carbajal to Congress, Hannah-Beth Jackson to the State Senate, Monique Limón to the Assembly, and Das Williams and Joan Hartmann to our Board of Supervisors, deeply appreciates our work on the phones, on the streets, and around the headquarters on State St. Things will get busier and more demanding as we head into May and June, but pay attention, the magic is about to begin. 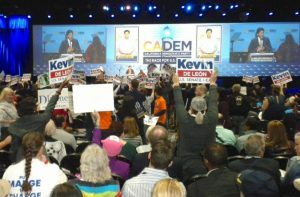 Political conventions, such as the California Democratic Convention I attended a couple weeks ago in San Jose, could be easily mistaken for a high school pep rally–crowds of cheering partisans wearing team jerseys and booster buttons, waving placards in a noisy arena. But that misses a crucial difference: we are more than just fans in the bleachers. Convention delegates come together at these affairs–chaotic as they may be–not just to cheer, but to pick the players we want to see on the field and to hammer out a winning strategy. Through our collective decisions, the contest is ours to win or lose. Because these choices have been settled, the DSC can now swing into action on behalf of these candidates. Just a few days ago we mobilized our renowned Mailing Brigade to carry out a two-day project for Salud Carbajal’s campaign for Congress. And, as we have done in the past, we will be staffing a “welcome desk” at his Santa Barbara headquarters to provide consistent service and voter registration as needed on a day-to-day basis (see items below on both these DSC activities). We will also be working in various ways for Sen. Hannah-Beth Jackson and for Monique Limón, both endorsed by the state party, in their quests for seats in the State Senate and Assembly respectively. And at the county level, we will be supporting Das Williams and Joan Hartmann as they campaign for 1st and 3rd District Supervisor seats. Hartmann’s race in the 3rd District will be one of the most contentious at any level and will require Santa Barbara Democrats to recognize their enormous stake in a race they may not actually vote in. 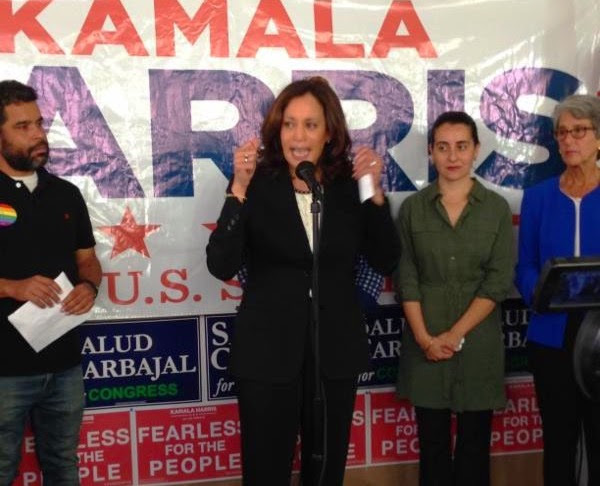 I’m also pleased to note that for the U.S. Senate seat that Barbara Boxer is retiring from, California Democrats are backing our Attorney General Kamala Harris, who has a proven record of fighting to level the playing field for California students, families, consumers, and victims of all sorts of crimes and abuses. Besides settling on a starting line-up, CDP delegates voted to take a position on a number of key statewide initiatives that are slated for November, including ones that support gun safety, a plastic bag ban, common-sense criminal justice reform, an extension of Prop 30’s funding for education, and a sizable cigarette tax boost. The closest we had to a real cheerleader in San Jose was Vice President Joe Biden, who spent nearly an hour on the podium doing his best to rally our spirits for the battles ahead. I think you’d enjoy watching his speech here. It’s a little slow to start, but he knows how to work a crowd. Of course, this convention hoopla will be repeated in late July at the national level in Philadelphia, where just becoming a delegate will be much more selective, and where, because the scope is nationwide, the results may or may not please each of you. However that goes, though, I can confidently report that California has put together a talented team with a winning strategy. Incidentally, if I were describing the state of affairs for the opposition, I would have to abandon the sports analogy altogether. 2016 for the G.O.P. is very much what astronomers call a black hole. No winners there.